This car has a distinct style. There is no need to show off. No need to go over the top. 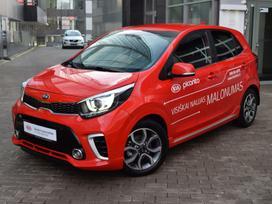 When you notice the luxurious Picanto strolling along the street, you'll understand: it is exactly what you need - a well built good car. Sensible form and functionality. You seek for sporty character, yet want to take your sports gear along. Small is beautiful, however, you want to take your friends along. No problem. The new Picanto offers the best feature of a city car - flexibility. Sunroof and automatic climate control provide comfortable pleasure by letting in some light and maintaining cool or warm temperature, depending on the weather. Prices are based on the pricelist of the manufacturer or sales representatives that were presented on their websites on the day of the renewal. UAB "Diginet LTU" is not responsible for price changes and seller's ability to offer a specific modification car.